All photos are copyright 2002 by Patrick Sun. Unauthorized use without written consent is prohibited. Now we return you to your regularly scheduled convention. Hint: When you click on your first picture link, don't close the window, I've designed it so that you can leave that window open, and you can click to your heart's content, and the images will only show up in that one other window. This should also speed up your visit here. So just open up my DC2002 web pages, and leave the picture window open, it'll seem like the photos just magically appear as you click about the photo album here. 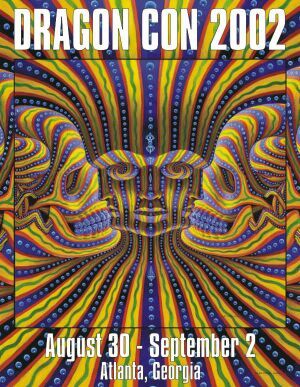 Dragon*Con is a 4-day sci-fi/fantasy/comic/gaming/video convention held in Atlanta, GA. This year it was held on the Labor Day weekend (Aug. 30-Sept. 2) at the Hyatt/Marriott hotels, all of which are located downtown and right next to each other. The art show was located in the Marriott Hotel. The Dealers Room and the Walk of Fame were located at the Marriott Hotel. They got smart and put the Walk of Fame where Artist Alley was last year, and vice versa. This made the Walk of Fame much more cooler and tolerable than last year. But Artist Alley didn't get all that hot like last year. Once again, this year's arrangement allow me to show up early in the day at the Hyatt where the panels and track programming were held, and then spend the rest of the day down in the Dealers room and Walk of Fame in the Marriott. There was plenty to occupy most of my time for the four days I was there this year. Yet again, since I didn't attend any of the other major comic-related conventions this year, I had to make the most of what Dragon Con had to offer. As I did last year, I brought a digital camera (Olympus D460Z), a 64MB Smartmedia card, and 3 sets of 4 AA NiMH rechargeable batteries, so I was armed and ready for whatever showed up at Dragon Con this year. The idea of having unlimited film (more or less) at a convention is truly frightening, and this webpage is a direct realization of that concept. I even took some real film photos for the conventional scrap book, and I still managed to shoot about 3 rolls of film for the Dawn contest. But the time saved in scanning real photos and price of film developing made the digital camera a worthy purchase. I have finally scanned/uploaded the film photos and incorporated them into their respective webpages. Note: This year I'm going to try incorporating thumbnails, so the pages will take some time to load. I may try creating the older, sleeker version if time permits (the old format from the past couple of years). I know this isn't the prettiest website out there, but I hope to make it up in content. I think there's over 1600 photos on this webpage! Enjoy! So how many have visited since 09-10-2002?